Free Shipping Included! 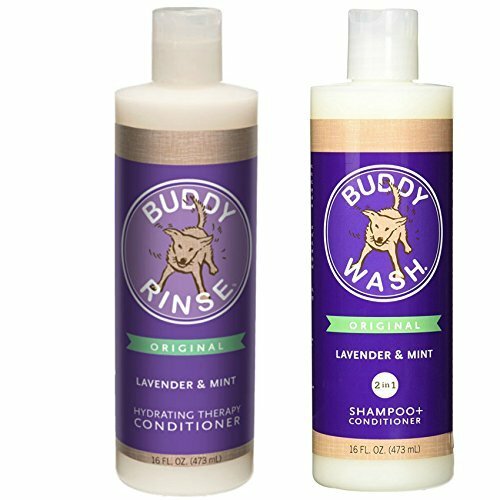 Cloud Star Shampoo and Conditioner Lavender & Mint Combo Pack for Dogs: (1) Buddy Wash 2 in 1 Shampoo + Conditioner and (1) Buddy Rinse Hydrating Therapy Conditioner (2 Bottles Total, 16 Ounces Each) by Cloud Star at Annie's Dog Spa. MPN: 43235-179465. Hurry! Limited time offer. Offer valid only while supplies last. Deodorize, moisturize and rejuvenate your pet's coat with Buddy Wash Shampoo made with pure, all natural ingredients and botanical extracts. Deodorize, moisturize and rejuvenate your pet's coat with Buddy Wash Shampoo made with pure, all natural ingredients and botanical extracts. Specially formulated using coconut oil, aloe vera and vitamin E to provide a soothing, healing and non-irritating bathing experience for your pet. This gentle, light and refreshing shampoo uses herbs and natural oils to freshen and deodorize your pet's coat without using chemicals or additives. Soap free formulation yields a rich and fluffy lather, yet rinses away easily. Buddy Wash is not tested on animals and is safe for human use. Buddy Rinse is specially formulated with pure botanical extracts and natural oils to soften, shine, detangle and revitalize your pet's coat without using any harsh chemicals. Easily works into your pet's coat yet rinses out completely. Buddy Rinse is not tested on animals and is safe for human use. If you have any questions about this product by Cloud Star, contact us by completing and submitting the form below. If you are looking for a specif part number, please include it with your message.